The Piermasters House, photographed by author 2004. 'The Mayor (Mr W Hornbrook), formally opened the new waiting-rooms, pier master’s residence, etc., at Northcorner yesterday afternoon. The want of warehouse and waiting-room accommodation at this landing stage has long been felt by both traders and passengers, and in November 1897 the Corporation obtained from the Board of Trade the necessary powers to erect the present building. More than ordinary care has been exercised in arranging the plan of the premises, in order to secure within a limited area the necessary accommodation for the many and varied requirements, which include storeyards, waiting rooms and lavatories, and a Piermasters residence and office." During North Corner's early history the quayside and landing slips were owned by the Lord of Manor. Leases were issued from the Manor to traders, but the traders didn't always look after the quayside nor did they plough investment monies into it. Thus in the latter part of the Victorian period commercial life at North Corner started to flounder. In 1870 Joseph Charles Stuart wrote to the Manor authorities stating that “trade is entirely gone from this place”. 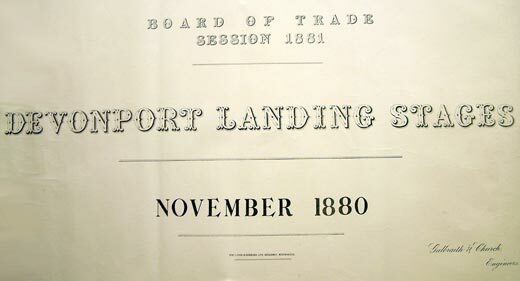 By 1880 Devonport Corporation started to address the issue seriously; around this time the Corporation had formed a Landing Stages Committee and had invited Galbraith and Church, Engineers, to develop plans for new landing stages in Devonport. In 1880, Galbraith and Church drew plans for two Devonport Landing stages; one at North Corner, the other at Pottery Quay. The drawings for both are contained in a document at Plymouth & West Devon Record Office ; of which the image below is the cover. It would appear that these are the same landing stages that Brian Moseley refers to, when he describes their completion in 1883 . Moseley writes, "... on Wednesday October 10th 1883 the Mayor and the members of the Landing Stages Committee, Councillors Graves, May, Mogg, Peck, Ryder and Whitby, met at the new North Corner Landing Stage to receive it from the contractor, Messrs Pethick Brothers. It cost £540." The new landing stage was officially opened on 3rd November 1883, and was operated by Mr G Hocking. Mr Hocking did have an office on the quayside but in the event that building turned out to be temporary, lasting only until 1899. As per the headlines in paragraph one above, another improvement happened to North Corner in 1899 - the Piermaster's House was constructed. Devonport Corporation did indeed plough efforts into North Corner since taking it over from the Manor authorities, keeping their commitment made earlier in 1880. 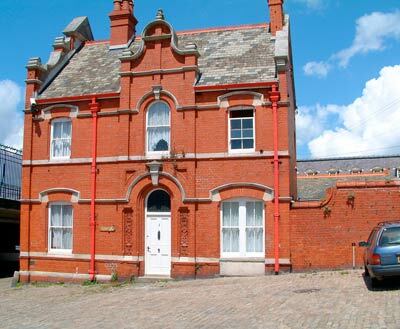 The Piermaster's House, as you can see from the image, was delightful, and most importantly, it was extremely functional. The contract was carried out by Mr H E Skinner, of the South Western Building Yard Plymouth, from the design and under the superintendence of the Borough Surveyor (Mr J. F. Burns) and his architectural staff. The building cost £1,492. A few yards north of the Piermaster's House, set against the gunwharf wall, a public lavatory was built at the same time, "constructed of brick throughout, with moulded Portland stone dressings." The lavatories cost £198 and the contractor was a Mr S. Perkins. Thus as well as the waiting room in the Piermaster's House, which was heated when cold, river passengers had their personal conveniences catered for even when the waiting room was closed. There was a large gathering at the opening ceremony, which was performed by the Mayor in a gale of wind, with the spray from the river dashing a long way up the quay. The company having inspected the building Mr G. Risdon (Chairman of the Landing Stages committee) expressed his thanks to the Mayor for being present to open the "beautiful building, which would supply a long-felt want in that part of the Borough". 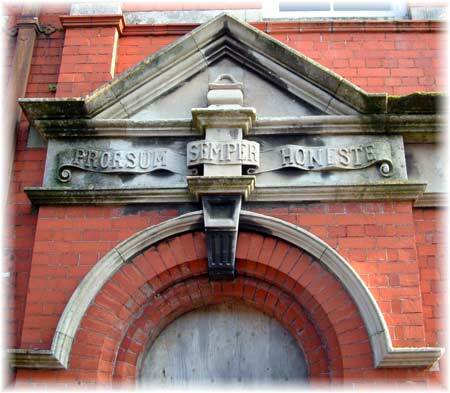 Above: Pediment over the waiting-room door, with Devonport motto. Above: The side of the building facing west, to the river. 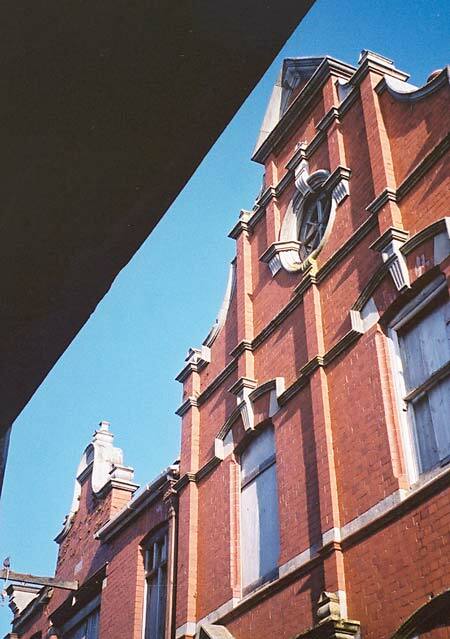 Photo taken in 2000 during the building's desolation stage. The black portion in the image is the 1963-built bridge at North Corner, which the photographer was standing underneath. As a corporation office the function of Piermaster ended during the 1950s; the last person to hold this role being Bill Jefferis. Mr Jefferis continued to live in the property for many more years after his Piermaster employment ended. Bill Jefferis was rehoused in nearby Cornwall Street sometime during the early 1970s. After this the building was finally closed up, suffering severe damp. Council committees periodically discussed the damp, and by now vandalised, building, evidenced by articles being published in local newspapers in 1974 and 1976; they didn't know what to do with it, whether to keep or sell it? Above. 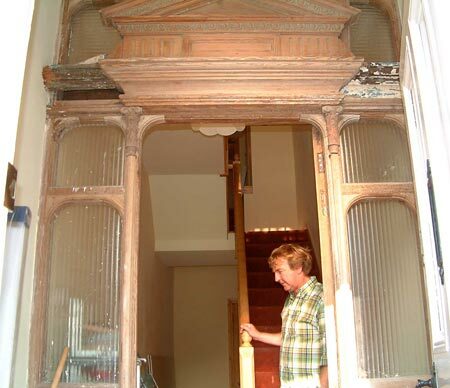 John Hamilton working on improving the property, in 2003, standing just inside the main front entrance. Note the wooden pediment structure overhead, with its markings. 12th September - I was pleased to receive an email from the current proud owner of the property, Janet Trewin. Janet said she bought the property in 2006 for £360.000 from John Hamilton. She went on to say, "The building is currently listed as an HMO (House of Multiple Occupancy) and is currently undergoing major works, as requested by Plymouth City Council, i.e Fire alarm system, fire doors, and walls, etc. It will remain in this form for a long term, as we bought it as an investment. Love the building, had a few nightmare tenants, and hope one day to see that awful bridge come down, so this house can once again be seen in its full glory properly from the front." Thank you for your email and update Janet, appreciated. Western Daily Mercury 8 April 1899. Personal communication between author and John Hamilton, 2003. John wouldn't reveal the exact sum he paid for the building, but stated "around £50k"